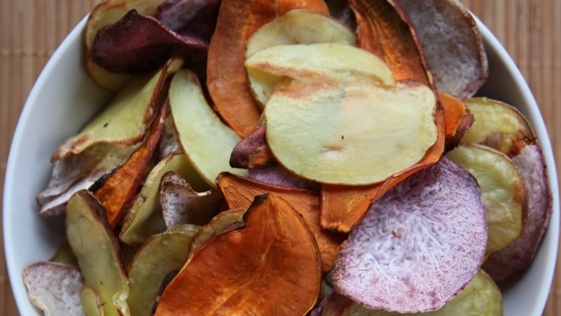 Homemade potato chips are healthier than store-bought chips and easy to make. 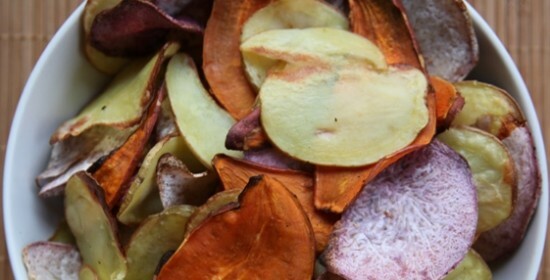 Also try sweet potato chips and taro chips. Try adding different spices to the chips before you bake them, just sprinkle on both sides of chips along with the salt (if using). Serve with a cool, creamy ranch dip...recipe link below. Preheat oven to 500 degrees. Wash and dry potatoes and taro root (if using). With a food processor, a very sharp knife, or a mandolin for cutting vegetables, slice the potatoes into as thin of slices as possible. Or a little thicker, about 1/8 inch thick if you like thick-cut potato chips. Spread the slices on a cookie sheet and spray with a little oil. Add salt if using. Turn over and spray the other side of the slices. Add salt if using. Put the slices in the oven and bake them for 15 to 20 minutes, turning them once halfway through baking. Chips should be slightly browned at edges and crisp but not burnt. Cool and enjoy! DIRECTIONS: preheat oven to 350ºF. Wash, dry, and remove stems from kale. In a large bowl, whisk oil with salt and spices if using, and toss with kale leaves. On a baking rack or baking sheet lined with parchment paper spread kale in single layer. Turn at least once during baking, using tongs. Bake 10-15 minutes until kale is crispy but not burnt. NOTE: optional spices, try one or a mix of several: fresh cracked black pepper, chili powder, chipotle powder, cayenne pepper, garlic powder, onion powder, Italian seasoning, Mrs. Dash seasoning blends, etc. DIRECTIONS: preheat oven to 500ºF. Using mandolin or sharp knife, thinly slice vegetables like zucchini, yellow squash, carrots, pumpkin, kabocha squash, butternut squash, green beans [leave whole], etc. Peel Winter squash first. Toss in a bowl with oil, salt, spices and bake on baking rack or baking sheet until crisp, turning with tongs, at least once during baking.